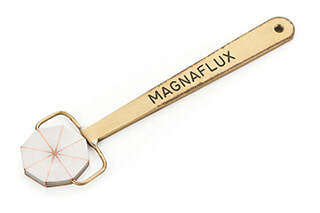 This range of field indicators is to help you check and measure magnetic field strength and direction during the magnetic particle inspection process. Rugged, pocket-size 10 and 20 gauss meters and pie gauge indicator provide flexibility in measuring residual part magnetism, field direction and AC/DC field strength in mag particle testing applications.This range of field indicators is to help you check and measure magnetic field strength and direction during the magnetic particle inspection process. 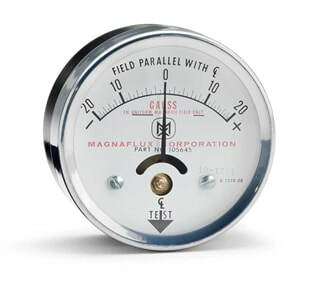 Rugged, pocket-size 10 and 20 gauss meters and pie gauge indicator provide flexibility in measuring residual part magnetism, field direction and AC/DC field strength in mag particle testing applications. 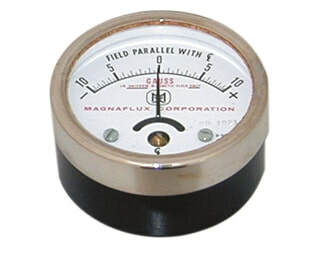 Rugged, pocket-size meters used to indicate residual magnetism remaining in part after magnetization. Inexpensive, disposable, non certified field indicator. 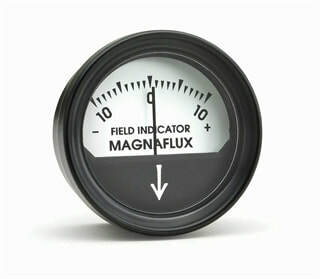 Rugged, pocket-size meters used to indicate residual magnetism remaining in part after magnetization. Accurate to +/- 0.5 gauss with scale range of 10-0-10. Certification is provided. 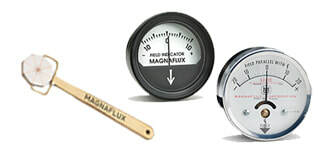 Rugged, pocket-size meters used to indicate residual magnetism remaining in part after magnetization. Accurate to +/- 1 gauss with scale range of 20-0-20. Certification is provided.